"Employee Engagement" The buzz phrase that identifies the holy grail of 21st century business success! For starters, I just have to share a funny conversation I recently had to put this into historical perspective. I was talking to my 90 year old grandma this week about how we had been recognized for employee engagement scores in the 99th percentile nationally, because it's ok to toot your own horn to your grandma, right! As we talked I realized how foreign this entire concept was to her. My grandma, a child of the Great Depression, did factory work for a living until the day she retired. She was proud to have a job she could go to every day and work her fingers to the bone, the end. 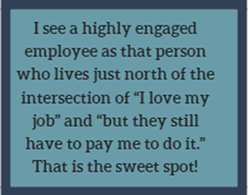 She actually chuckled when I told her that it's quite common now for employers to ask their employees if they're happy with their pay, their leadership, how they're treated at work, etc. Grandma rarely chuckles and boy did she get a kick out of the idea of asking someone if they're happy with their pay! Fast forward through the epic transitions that started in the 1990s and here we all are almost 30 years later, frantically searching for what we call "highly engaged employees" in a world where literally every single thing has a google review to reference. I'm excited to talk about employee engagement today, because it seems we have stumbled upon the recipe here for the secret sauce everyone is looking for! So what does a highly engaged employee look like, why does it matter and what does it take to achieve it? According to my friends at Wikipedia, an engaged employee is fully absorbed by and enthusiastic about their work and so takes positive action to further the organization's reputation and interests. Having highly engaged employees is the ultimate key to the success of any business. We all know this. We know that how we feel about our experience with any business is going to come right down to the individuals we dealt with on the front lines. If they're checked out or distracted, it's going to dramatically shape our experience and impact the success of that business. On the other hand, an engaged employee can make you walk out of the DMV feeling happy that you stopped by. Our employees harness that kind of power...the power to make today great, just ok, or horrible. When a company can report their employee engagement is the 99th percentile nationally, that's a pretty good indication to a customer that they'll have a great experience at your establishment. Everyone is winning in this type of environment, because it's about more than the job and it shows. We are in the business of surgery, so it's pretty uncommon for people to look forward to coming to see us. This is no secret. We work extra hard and go the extra mile to make them feel comfortable through building trust and connections from the moment they walk in. It's important and it's what we would want for ourselves in the same situation. We simply couldn't do that with a group of indifferent staff members. I just had to step away as I'm writing this, because a patient of ours just drove all the way here to share a batch of his world famous John Wayne Birthday Cake. (You know who you are and thank you so much! ;-) These are the types of relationships highly engaged employees create in an organization. We know what it is, we know why it's important, but how do we make it happen? What's in the secret sauce? It's about a shared mission and it's about relationships. It's the right people in the right place given the resources and autonomy to work together toward a shared passion to produce a product greater than the sum of their parts. The mission at CSA has always been simple –take care of the patient! 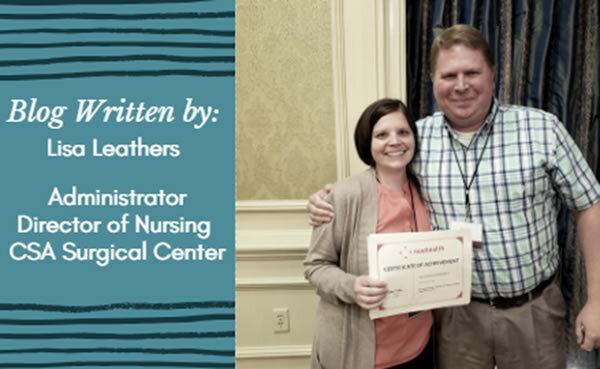 Our simple but direct mission statement eliminates a lot of confusion and allows us to attract a team of high performing professionals who all share that same internal mission statement to serve… to take care of the patient. Then it is our culture – actually taking care of the patient above all else and being recognized and rewarded for doing so- that keeps us coming back. We are all naturally moving in the same direction, so imagine the synergy we create moving as one in a direction we all want to go! Of course there is planning, strategy and direction that keeps us focused on the next opportunity. If you want to know more about all that, you'll have to read our book! Meanwhile what I can tell you, is you know how there are those times in life when you know you have found something extra special? When it all just clicks and comes together. That's what we have at CSA Surgical Center and we look forward to sharing it with you! It's a good place to be a patient!